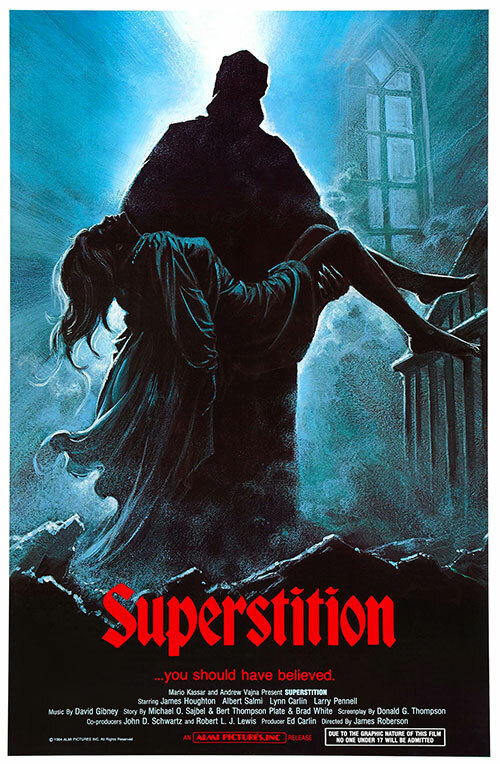 What makes "Superstition" stand out from the rest of the bunch is its very unique combination of sadistic splatter and hellish horror. Think of something as scary as "The Exorcist" and add all the delicious splatter of your slasher films and you are in the right ballpark. Its like the combination of Dario Argento's talent for concocting an atmosphere of dread and doubt and his fondness for witches plus Lucio Fulci's knack for using extreme gore as a means of making a movie interesting. It's a no holds barred, take no prisoners horror movie. It's not just a gore film, which filmmakers today are so fond of making and advertising as horror, it gives you genuine chills as well. The witch in the movie is as scary as hell and she will make your blood run cold and she makes you wonder what's worse: her stalking of the characters or the ways she gruesomely kills them. One of the unique films that truly define the word "horror". 0 Response to "Superstition (1982) James W. Roberson"